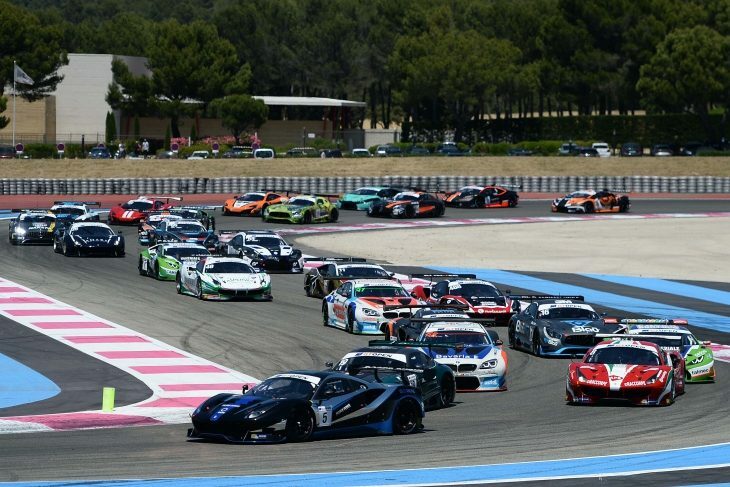 Paul Ricard played host to the biggest International GT Open grid of the year last weekend, with 27 cars taking the start of the first race on Saturday. It was a challenging weekend for several of the teams who have taken 2017 by storm thus far, including both the Emil Frey and Farnbacher Lexus squads. In Qualifying, Mikkel Mac (#488 Spirit of Race Ferrari) put in a superb effort to score pole position. Mac’s time of 2:03.957 edged out the #20 SPS Automotive Mercedes of Tom-Onslow Cole by less than a tenth of a second. Before the race, there was drama for the #555 FFF Racing Team Lamborghini and Vitantonio Liuzzi, as the car came to a halt in flames on the way to the grid. Unfortunately, this would mark the end of the weekend for the team. Augusto Farfus, a late replacement for Tiago Monteiro in the #51 Teo Martin BMW, was the early leader once racing got underway. He had started in third, but made his way up the inside of Mac before the first corner. The top three – Farfus, Mac and Rob Bell (#22 Balfe McLaren) – looked to be breaking away from the field. As the first stint wore on, Mac was working over-time to try and pass the BMW factory driver, while also having to fend off Tom-Onslow Cole and Giovanni Venturini (#1 Imperale Lamborghini). The latter pair leap-frogged Rob Bell with almost half an hour complete, and set about attacking Mac. With 33 minutes to go, Farfus entered the pits to hand over to Lourenço Beirão da Veiga. As the Portguese driver slotted into the BMW, smoke started billowing from the cockpit. Wisely, he vacated in short order, marking a premature end to a promising race for the #51 Teo Martin team. This incident relieved pressure from Miguel Ramos, who had taken over the #488 Spirit of Race Ferrari. The 2015 champion crossed the line at the end of 70 minutes to take the team’s first victory of the year by just under ten seconds. Thomas Biagi took over from Venturini in the #1 Imperale Lamborghini to take second. Third place overall, and PRO-AM victory, went the way of the #20 SPS Mercedes team, after Valentin Pierburg put in a solid stint to capitalise on Onslow-Cole’s early pace. The Emil Frey Lexus of Philipp Frommenwiler and Albert Costa completed the PRO podium, and finished fourth overall. The Farnbacher Lexus completed just eight laps, with Dominik retiring due to power steering issues. The #8 Perazzini/Cioci AF Corse Ferrari took second in PRO-AM, while the #16 Drivex Mercedes of Marcelo Hahn and Alan Hellmeister completed the class podium. The #48 Kaspersky Ferrari of Alex Moiseev and Davide Rizzo took the AM class victory. For the second race, the #5 SF Racing Ferrari of Andrea Caldarelli took pole position, ahead of the #19 Lechner Racing Mercedes of Thomas Jäger. The series newcomers would be looking to improve upon a promising tenth place overall the previous day. Caldarelli retained the lead in the early going, and the majority of the field remained in grid order during the opening laps. On lap six, it was Mario Farnbacher’s turn to retire the #55 Lexus, with a re-emergence of the steering issues from yesterday’s race. Caldarelli gradually extended his advantage during the first stint, while Jäger retained second ahead of Marco Cioci in the #8 AF Corse Ferrari. After the pitstops, Fu Songyang briefly led in the SF Racing entry after taking over from Caldarelli. However, Songyang continued to drop down the order throughout his stint, finishing outside the points. 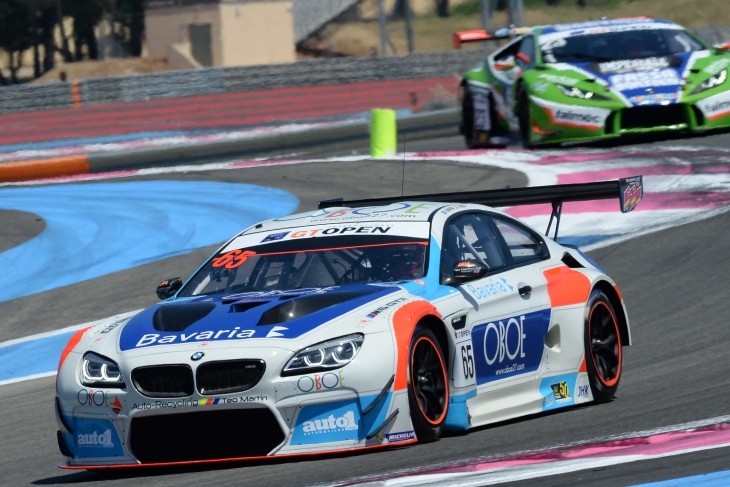 Victor Bouveng was the first to dispatch Songyang, and would eventually take the first win of the season for the #65 Teo Martin BMW outfit. 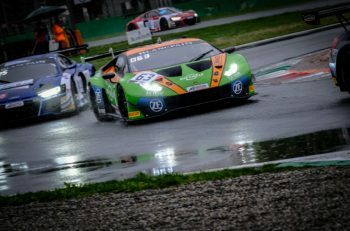 Andrea Fontana crossed the line second in the #23 Imperale Lamborghini, having dispatched third placed Marcelo Hahn early in the second half of the race. Hahn (#16 Drivex Mercedes) fought hard to retain third overall and first in PRO-AM, despite challenges from Piergiuseppe Perazzini in the AF Corse Ferrari. Perazzini took second in class, while Mario Plachutta completed the PRO-AM podium and the overall top five in the #19 Lechner Mercedes. 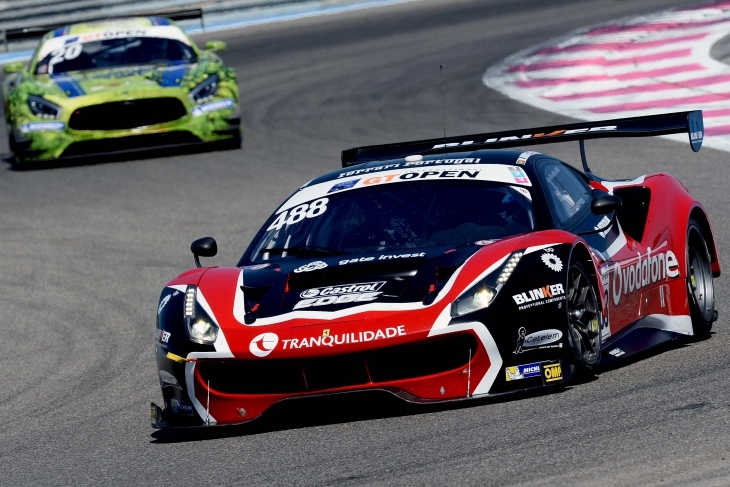 Giovanni Venturini finished sixth overall and third in PRO, behind the wheel of the #1 Imperale Lamborghini, while Miguel Ramos crossed the line next in the #488 Spirit of Race Ferrari that took victory in race one. 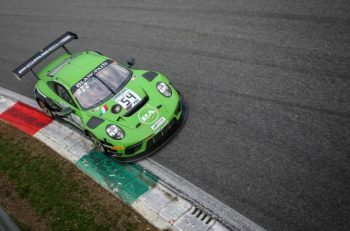 Alex Moiseev and Davide Rizzo took the #48 Kaspersky Ferrari to their second AM class win in as many days, handing them the lead in the AM class championship. Albert Costa and Philipp Frommenwiler still lead the overall championship in the #54 Emil Frey Lexus, but their lead has been reduced to just three points over defending champion Thomas Biagi and Venturini in the #1 Imperale Lamborghini. Fran Rueda and Victor Bouveng now sit third in the #65 Teo Martin BMW. A tough weekend for Rob Bell and Shaun Balfe in the #22 McLaren has demoted them to second in PRO-AM, behind the Cioci/Perazzini #8 AF Corse entry.